It’s no secret how much I adore the people from Love Drop. If you’re not familiar with them, then you must be new here because they’re all I’ve been talking about for the past two months. 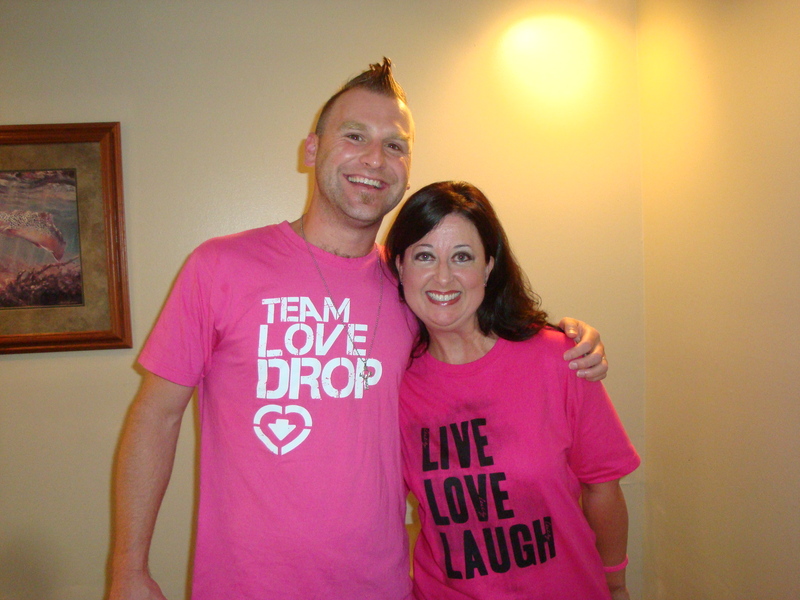 Love Drop is the micro-giving site dedicated to helping one new family or person per month. Last month they sponsored my sister, Lucy, who’s battling a rare blood disorder, Aplastic Anemia. Last weekend I met the founders of the site, Nate St. Pierre and a man I know simply as J-Money. 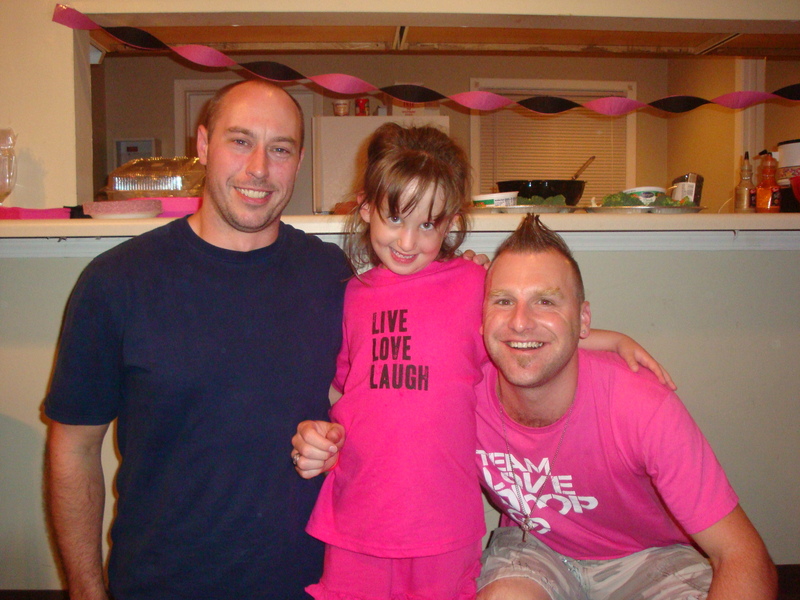 They stopped by our Love Drop going away party to wish Lucy well as she embarks on a 3-month journey to Omaha Nebraska where she will receive chemotherapy, a bone marrow transplant and start kicking this disease straight in the junk. Sorry, that wasn’t very ladylike. WELL, neither is this stupid disease. When Nate and J$ arrived, for me it was like meeting Bono and Santa Clause all rolled up in to one, but with less fanfare. 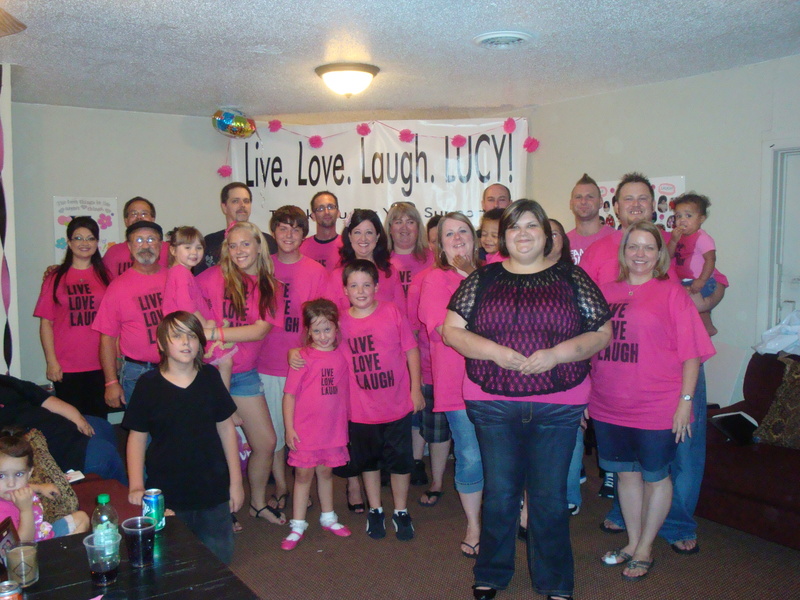 I think our big loud group, many of us wearing hot pink shirts emblazoned with LIVE LAUGH LOVE LUCY may have intimidated them at first because they just slipped in to the venue and quietly began to mingle. When it was time for them to open their bag of goodies, however, they did not disappoint. This month, in addition to a $3,000 goal we were trying to meet to help pay insurance premiums, Love Drop also asked their members to provide Lucy with things that would keep her occupied in Omaha. Members must have had a great time with this request. 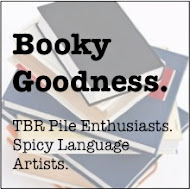 Lucy received stickers, stamps, stationary, card games, books, a mummy doll that does the Michael Jackon, Thriller dance and even a SpongeBob Hangman game. When Nate and J$ said, “Could you send Lucy a note of encouragement to read when she needs a little cheering up?” The people responded! At last count, there were 70+ cards and notes that rolled in for Lucy to take to Omaha. 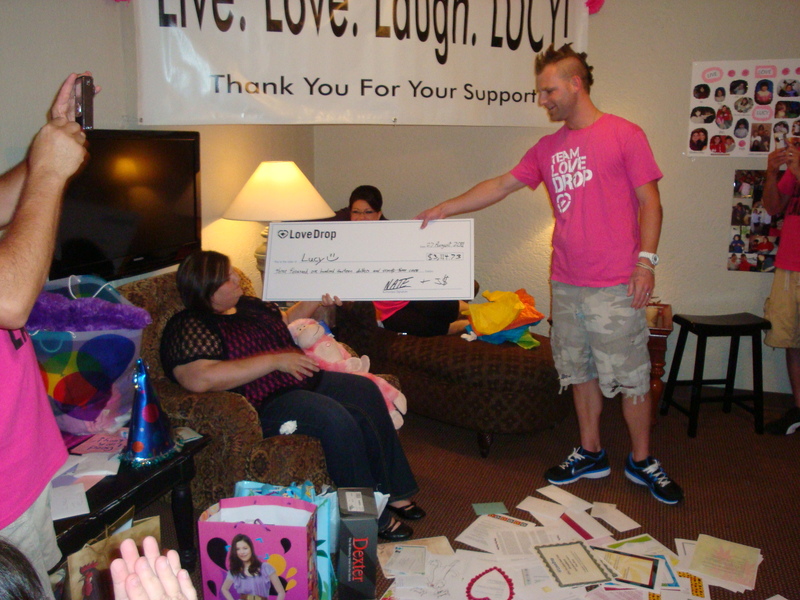 When the final check was revealed, gameshow style, we were thrilled to learn that Love Drop members and visitors raised almost $4,200.00 for sweet Lucy AND provided her with a laptop computer. This will allow her to keep in touch with all the family and friends who can’t be with her every day, but will desperately want to communicate with her. 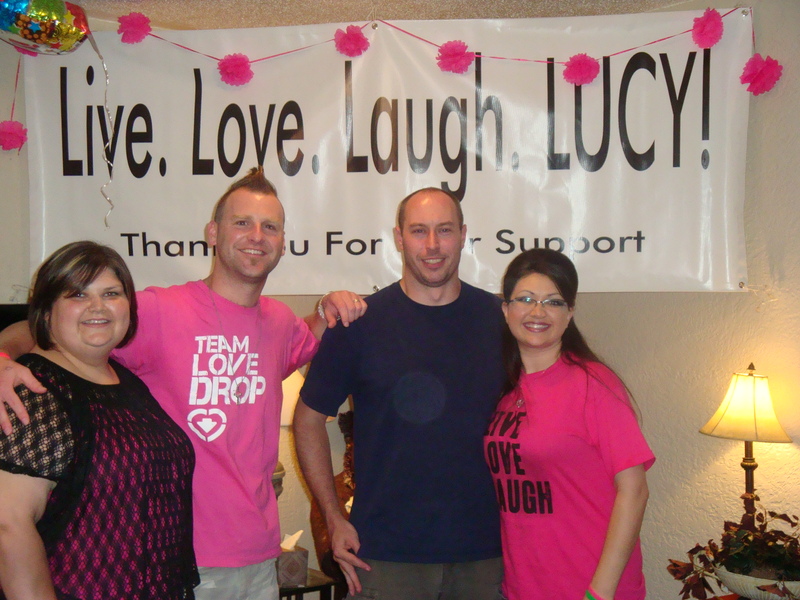 The Love Drop party for Lucy is a night I will never forget. Lucy’s friends and family and friends who have simply become family (Cat/Aaron/Meg/Arianne) packed in to the venue like hot pink sardines. 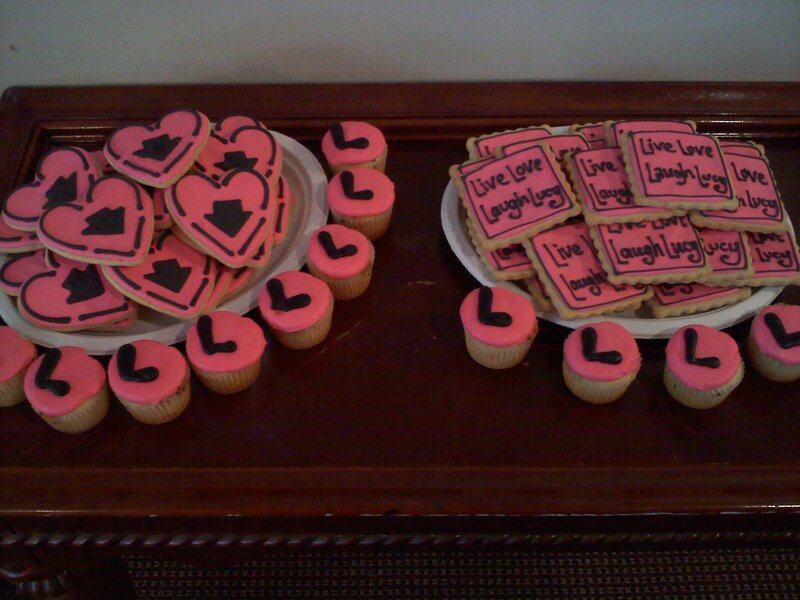 We dined on Love Drop cookies and Lucy’s favorite candy from Nifty Nuthouse. We heard stories about Lucy that made us cry with laughter. We watched Lucy open gift after sweet gift, and tried to make Tracy comfortable who the day before, had given the BEST gift of all, her delicious bone marrow. Nate and J$ had no obligation to stay when their portion of the night was over but they did. Even when the heat, the laughter and the sound of children’s high-pitched glee overwhelmed the room, they stayed. That’s the kind of men they are, they care. To all the Love Drop members I’ll never meet, the family members, friends and extended families who donated this month, to Shannon Henrici, the Twitter buddies, the Facebook pals. . . thank you from the bottom of my heart. Know that you did your part this month to make sure Lucy has the financial/mental arsenal she needs to fight this disease. To Nate St. Pierre, J$, Dennis Hildebrand, Mary Montavon, you have created something that will touch people in ways you never could have imagined. Thank you for helping my sister and inspiring others to do great things. This is your legacy. 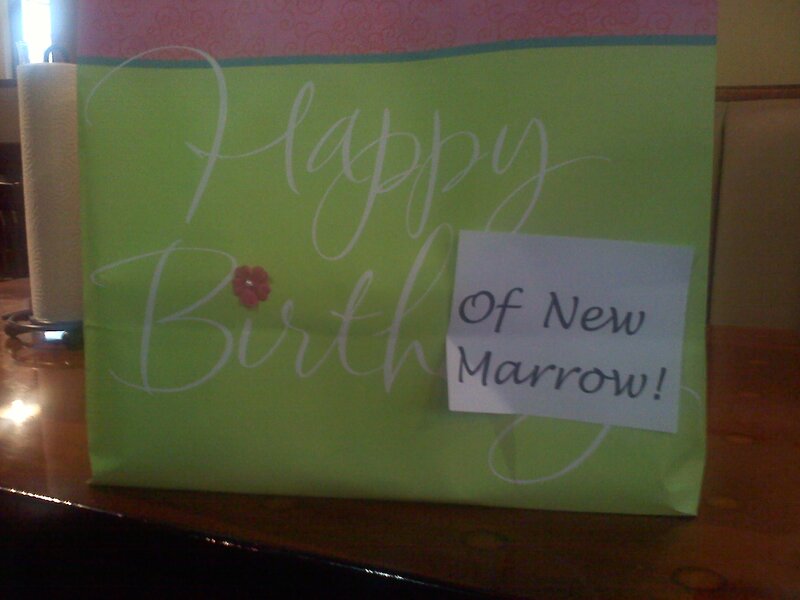 Dear Lucy, Happy Birth of New Marrow! Love you! Categories: Blog, Uncategorized | Tags: anemia, aplastic, Aplastic Anemia, chemotherapy, drop, J Money, love, Love Drop, lucy, nate st. pierre, Nebraska | Permalink. ❤ This makes me smile to read. Thank you for letting us be a part of Lucy’s journey this month. YES!! Beautiful beautiful family y’all have — such a blessing to be there and celebrate with everyone 🙂 As Nate said above, your Drop really WAS one of our favorites! Thanks for welcoming us so warmly into your lives, and we pray so HARD that Lucy will be back in action in no time. Have a great holiday weekend everyone! !